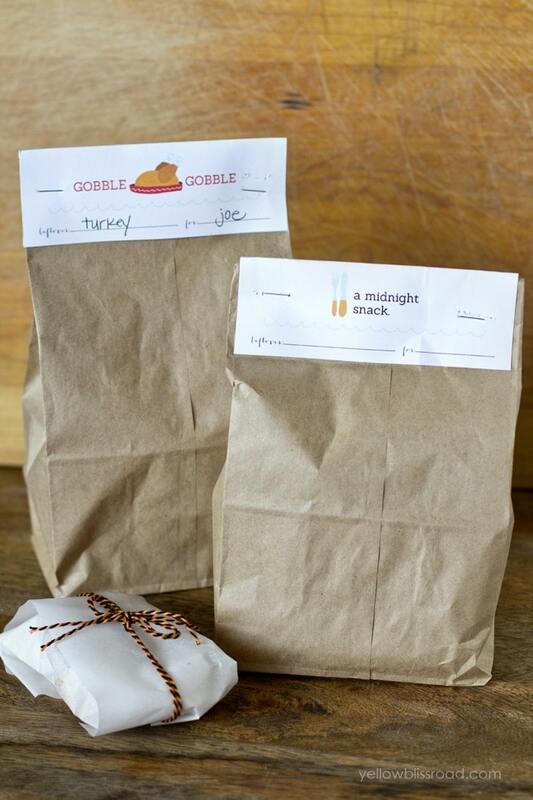 FREE Printable Thanksgiving Leftover Tags! Hello Tatertots and Jello readers! It’s Kristin from Yellow Bliss Road, back again with another free printable for you. I can hardly believe Thanksgiving is just weeks away. It feels like my kids just started school, but they’ve already been in school for eight weeks! I guess it just means we’re getting closer to my favorite time of the year. I love November and December. They are by far my favorite months. It’s crazy and insanely busy, and the house doesn’t stay as clean as I’d like, but my kids are excited and full of wonder and imagination and it just makes me happy. What better way to kick off the season than with a huge Thanksgiving feast! I don’t know about you, but we always have leftovers after Thanksgiving dinner. These cute printable Thanksgiving Leftovers Tags will be perfect for dressing up your leftovers to send home with your guests! Stuff them with turkey, cookies, pie, or containers of mashed potatoes and stuffing. *Tip: keep a roll of parchment paper and some baker’s twine on hand for wrapping up leftover turkey. The toppers come in two sizes and three different designs. The larger ones will fit on a quart sized ziploc bag, and the smaller fit perfectly atop standard size brown paper lunch sacks. (Make sure to get the standard size, not the large – I get mine from Target). No need to get fancy, just staple them to the top of the bags. 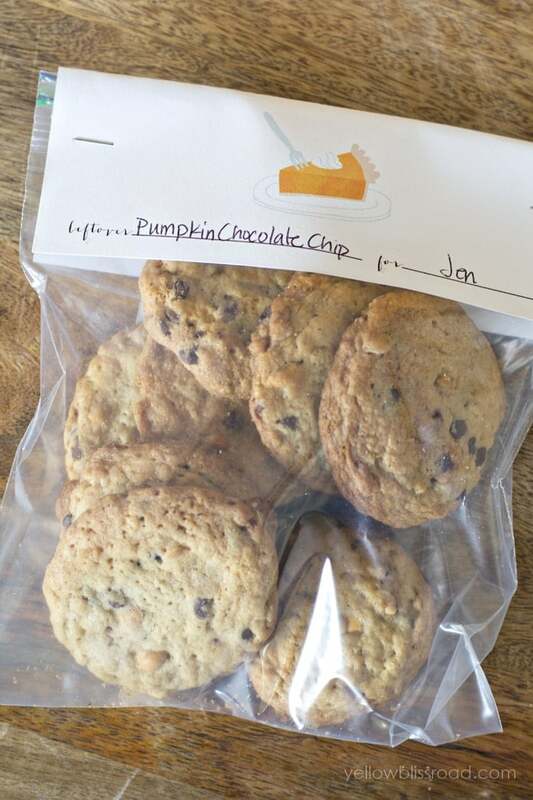 Everyone loves to take home a bag of cookies, and my Oatmeal Pumpkin Chocolate Chip Cookies would be a welcome take-home treat. Today at Yellow Bliss Road I’ve got some coordinating utensil holder envelopes, conversation starter cards and “I’m thankful” cards to keep your guests occupied and entertained before, during and after dinner! Hope to meet you at Yellow Bliss Road soon. With the holidays coming, there will be tons of new printables coming, too! Thanks Kristin! I know in our house we are always dividing up the leftovers, so this is just perfect to make it more fun! 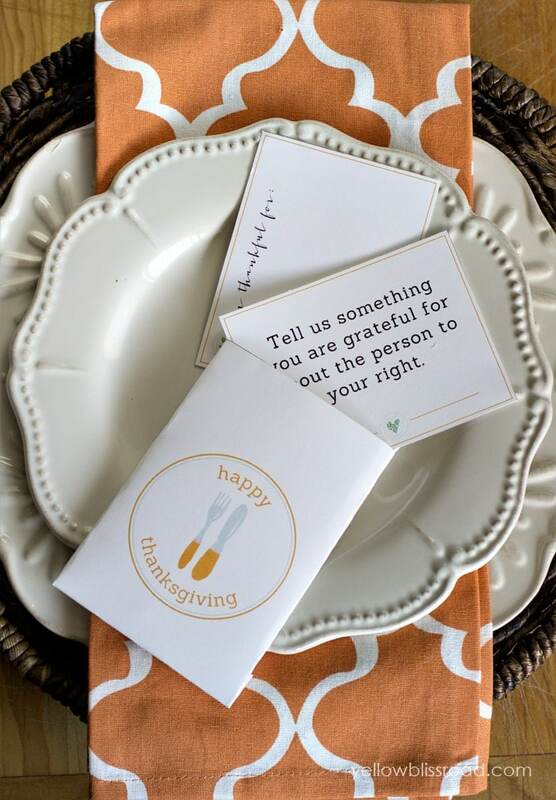 And her coordinating printables for Thanksgiving are just perfect. Kristin has such great ideas on her blog. Here are a few I think you’ll love. I love her Free Christmas Tree Printable. So simple, but so pretty! And when the weather gets colder, try throwing a hot chocolate bar party with these super cute Hot Chocolate Bar Free Printables! And, if you’re looking for an easy advent calendar idea, she has this adorable Free Printable Advent Calendar Kit! Free Printable S’Mores Gift Tag! Getting Ready for Fall Entertaining and FREE “Be Thankful” Printable! Great Ideas — 20 DIY Thanksgiving Ideas Part Two! These are adorable!!! I love the advent calendar too! I am going to try to make something like that this year!